In order to perform immunosurveillance and initiate antitumor immune response, dendritic cells must be physically present in malignant tissues. This chapter summarizes data on the density and functional status of tumor-infiltrating dendritic cells in different types of human malignant neoplasms, generated by immunohistochemistry methods. 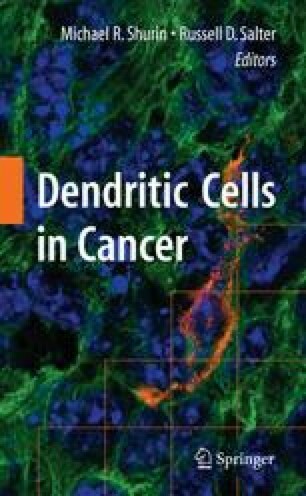 The results show that density and maturation of tumor-associated dendritic cells vary in specific types of tumors and correlate with histologic grade and clinical stage of the disease. In majority of cases there is positive correlation between intratumoral dendritic cell density and favorable disease prognosis; however, certain exceptions are present. Possible mechanisms of tumor-related alterations of dendritic cell homing, survival, and maturation at the tumor site are discussed.